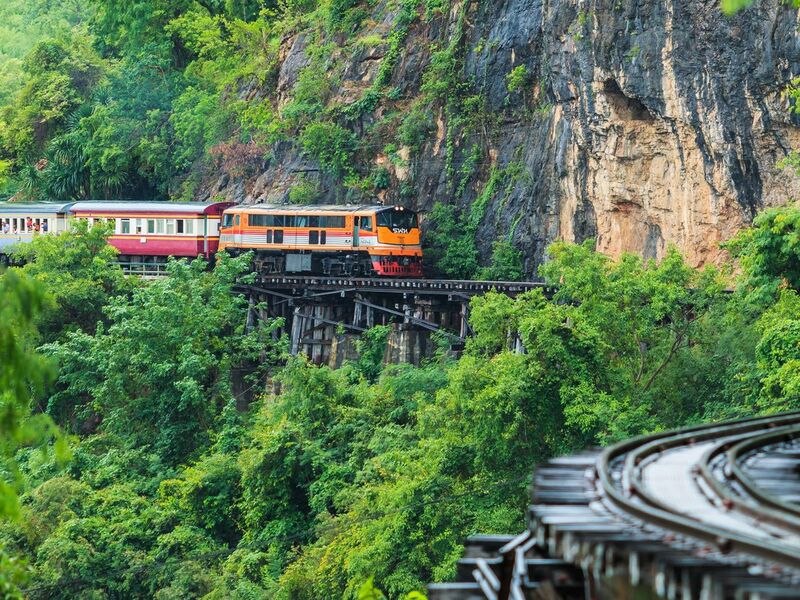 Take a train, sightseeing Bridge over the River Kwai, visit a beautiful waterfall, try good food. Join me on this fun and local trip. Stop by Nakorn Pathom and pay a visit Phra Pathom stupa, one of the most beautiful icons of the province. Arrive in Kanchanaburi province. Visit The Bridge of the River Kwai and learn the history behind the place. Let's take a train to sightsee the beautiful sight, visit historical places, and try a delicious food. No rush for this trip. Instead of rinding a car, we will get around places using one of the most classic/ local transportations of the locals. It's going to be fun! it is a one day train tour mainly for locals, no english broadcasting at all. It is lucky that she explained everything. In the noon, the rain dropped suddenly and heavily, she even got an extra umbrella for me. That really impressed me! When we finally went back, I would like to say this train journey makes my tour unique and welcome to my country! It was an awesome and fun trip, using Takemetour to travel with the local guides, I was able to understand the history more in-depth and to hear from ON and her friend, Kate, what are the places to visit and how do the locals travel. The funny thing was that when we were at the waterfall, it was their drought period and there wasn't any water at the waterfall. Even the guides have mentioned to us that this is the first time in her entire 10-years career working there that she see the waterfall dried up. But this did not dampen our spirits, we took a local bus, to the next destination, and ON and Kate was able to make decisive decisions to alternative plans. They are awesome travel companions and guides.